Note: this is a private property. Visits must be scheduled in advance with Merwin Conservancy staff. Mahalo. Hike through one of the most extensive palm collections known to exist on earth, located in Maui’s north shore Pe‘ahi Stream valley. Lovingly restored by the hand of one of America’s greatest living poets W.S. Merwin, the transformation of this once-barren and degraded land has inspired some of the most celebrated poetry of our time. 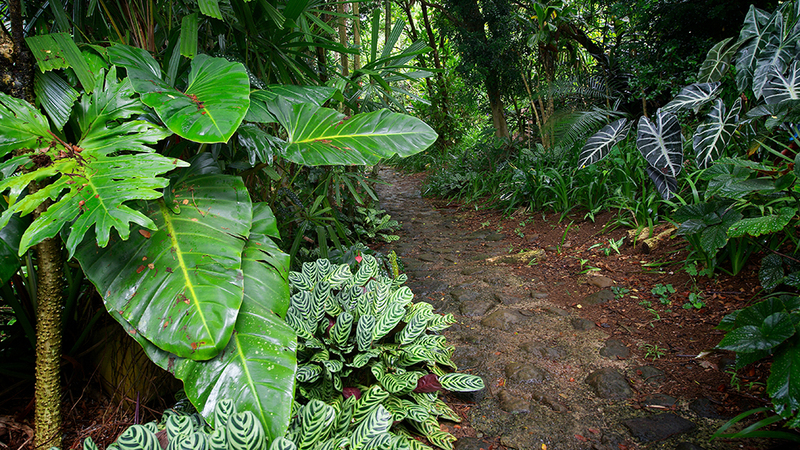 Now a lush, 18.8 acre palm garden, the Merwin property is home to over 2,740 individual palm trees, featuring more than 400 taxonomic species and 125 unique genera, with nearly 900 different horticultural varieties. A true “living collection”, these palms have been taxonomically identified, botanically tagged and extensively recorded in a database that can be accessed and searched online. One morning tour per month is booked in advance via The Merwin Conservancy staff, on a first-come, first-served basis, depending on availability. The group meets to carpool at a public parking area in Ha’ikū, and the entire experience takes about 3 hours, with driving time and breaks included. As this is more of a hike than a walk, participants should wear sturdy shoes and bring drinking water. Hikes are led by Merwin Conservancy staff and/or docents, and include informal historical and botanical conversation, poetry readings, and quiet reflection time. *Registrations are assigned on a first-come, first-served basis, and Open Garden Days fill up at least a month or two in advance. Early requests are encouraged. Interested in joining us for an Open Garden Day? Kindly complete our inquiry form below to submit a request*. Be sure to include your chosen date(s) – from the dates listed above – on the form. Open Garden Day visits are offered on a first-come, first-serve basis. Completion of this form does not guarantee registration. Please complete the inquiry form – as the date gets closer, a staff member will be in touch to confirm. *We understand that your availability may be different than the dates listed above. While we cannot guarantee any additional dates will be added this year, you may let us know your preferences when you fill out the request form, in case another opportunity opens up. Want to help us keep the Open Garden Days free for the general public? Make a donation to support our programs!